Note: You can make these in any flavor or variation. The basic recipe consist of the egg whites and Sugar. I of course added cocoa to make mine chocolate. You could do Almond, peppermint, lemon etc. 1 tbsp sifted cocoa powder. 1) Preheat oven to 300 degrees F and line two baking trays with parchment paper. 2) Beat the egg white with an electric beater/stand mixer into stiff peaks. 3) Add the sugar in, 1tbsp at a time, beating well after each addition. Beat the mixture until thick and glossy and the sugar has dissolved. It will take about 10 mins. 4) Beat in cocoa powder. 5) Spoon mixture into a piping bag with plain round or star nozzle and pipe onto tray. 6) Bake for 20 to 25 mins, or until pale and dry. 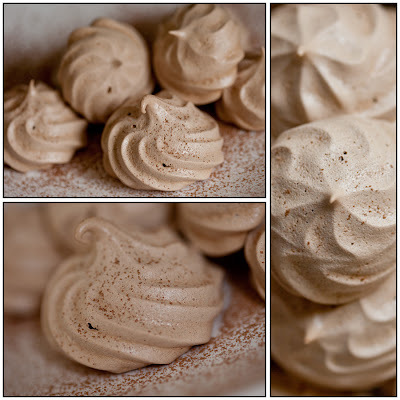 Turn of oven, leave the door ajar and cool the meringues in the oven. When cold, store in an airtight jar. yum! do you have a stand mixer? Hi Joanh, I do have a stand mixer and i love it. It makes it so much easier to bake especially when you need to whip things for a long period.